The longtime friend of the president faces obstruction and witness tampering counts involving efforts to learn about releases of Democrats' hacked emails during the 2016 presidential campaign. WASHINGTON — Special counsel Robert Mueller III unveiled criminal charges Friday against Roger Stone, a longtime friend of President Trump, accusing Stone of lying, obstruction and witness tampering in one of the longest legal sagas of the investigation into Russian interference in the 2016 election. In charging Stone, Mueller has struck deep inside Trump’s inner circle. The indictment charges that Stone, a seasoned Republican political operative, sought to gather information about hacked Democratic emails at the direction of an unidentified senior Trump campaign official and engaged in extensive efforts to keep secret the details of those actions. The 24-page document goes further than Mueller ever has toward answering the core question of his probe: Did Trump or those close to him try to conspire with the Kremlin? The indictment notes that before Stone’s alleged actions in the summer of 2016, the Democratic National Committee already announced it had been hacked by Russian government operatives, implying Stone must have known that. It does not allege Stone conspired with anyone, but suggests his mission was to find out how the stolen material would be made public – something that, on its own, would not necessarily constitute a crime. Indicting Stone caps one of the special counsel’s longest pursuits since its creation in May 2017, but it remains uncertain if Mueller is nearing the end of his investigation. After the early morning arrest at his home Florida home, Stone appeared briefly in federal court in Fort Lauderdale wearing a navy blue polo shirt, jeans and steel shackles on his wrists and ankles. The judge ordered him released on a $250,000 bond. Stone later stepped onto the courthouse steps, striking the famous pose of his personal hero, the late President Richard M. Nixon, by raising his arms high and making V-for-victory signs with his fingers. Stone told The Washington Post that he and Trump “never discussed any of these matters.” He insisted he played no intermediary role between the campaign and the anti-secrecy group WikiLeaks, which published the hacked emails, and denied that any campaign official asked him to reach out to the group, as Mueller has alleged. Trump tweeted angrily after the arrest: “Greatest Witch Hunt in the History of our Country! NO COLLUSION! Border Coyotes, Drug Dealers and Human Traffickers are treated better.” The president also suggested someone may have tipped off CNN to record Stone’s arrest, though there were growing signs the day prior Thursday that he could be charged soon. The indictment centers on Stone’s effort to learn when potentially damaging emails internal to Hillary Clinton’s presidential campaign would be released by Julian Assange, WikiLeaks’ leader. U.S. officials say Russian intelligence agents hacked Democrats and shared the emails with WikiLeaks, which publicized them during the election’s final months. After the election, according to the indictment, Stone tried to cover up what he had done by lying about it in his testimony to Congress and attempting to persuade another witness, identified only as “Person 2,” to refuse to talk to the House Intelligence Committee. People close to the case said Person 2 is New York comedian Randy Credico. As Credico prepared for possible testimony before the Intelligence Committee, Stone repeatedly pressured him not to reveal anything that would suggest Stone had misled the committee in his earlier denials, according to the indictment. In December 2017, authorities charge, Stone used a reference to one of the “Godfather” movies to try to keep Credico quiet. Roger Stone admits spreading false information; did he lie about DNC emails? Stone, 66, who has been friends with Trump for three decades, served briefly as an adviser to his presidential campaign in 2015 and then remained in contact with Trump and top advisers through the election. In sworn testimony to the House Intelligence Committee last year, Stone also denied any contact with WikiLeaks or knowledge of its plans, saying he did not intend to imply he had communicated with Assange directly. WikiLeaks and Assange have said they never communicated with Stone. During the campaign, Stone privately told associates that he was in contact with Assange and that WikiLeaks had material that would be damaging to Clinton. In an October 2016 email to Trump’s then-chief campaign strategist, Stephen Bannon, Stone implied he had information about the group’s plans. 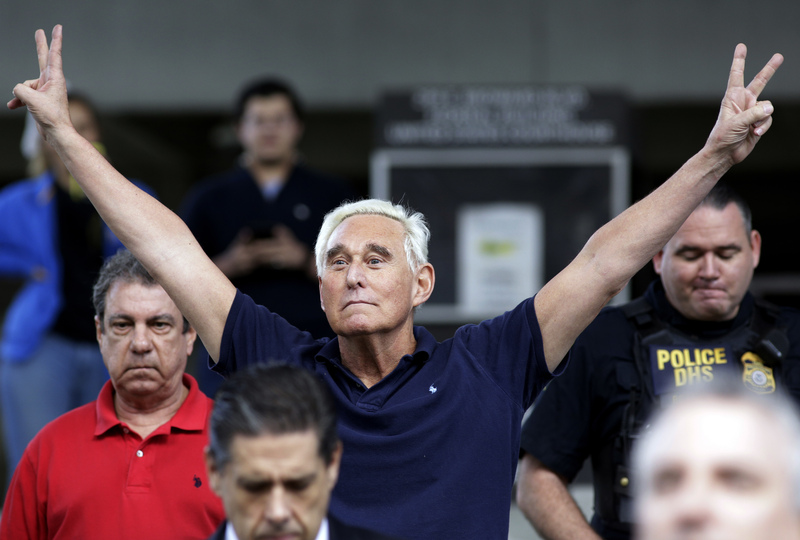 In recent months, Stone has offered conflicting accounts of who provided him with tips about WikiLeaks’ plans – first identifying Credico as his source and then acknowledging he also received information from conservative writer Jerome Corsi. Stone’s indictment leaves unclear whether Mueller plans to charge Corsi with lying to investigators about his interactions with Stone. Last year, Corsi was nearing a plea deal with prosecutors before he balked and accused them of trying to force him to say something untrue. With Stone’s indictment, the special-counsel investigation has now led to charges against 34 people and guilty pleas by six Trump associates and advisers, including Manafort, former deputy campaign manager Rick Gates, former national security adviser Michael Flynn, former Trump attorney Michael Cohen and former campaign adviser George Papadopoulos. Stone got his start in politics working for Nixon’s 1972 reelection campaign and sports a tattoo on his back depicting the disgraced ex-president. Since then, he has advised Republican and Libertarian candidates, including Ronald Reagan, Bob Dole and Gary Johnson. He also helped reshape Washington lobbying, founding a successful firm in the 1980s with Manafort that represented top companies and foreign governments.